The following was condensed for inclusion in issue 13, Summer 2002, of Cashers du Cinemart film magazine published by Mike White of ImpossibleFunky.com. Champaign-Urbana, Illinois is a college town of 100,000 people – excluding the 35,000+ students and faculty who drift in and out for the University of Illinois (UIUC) academic school year – which lies two hours south of Chicago. This is also the place where the most famous movie critic in America grew up and went to college. He moved to the Windy City in the mid-Sixties and became a staff writer for the Chicago Sun-Times, and not long afterwards graduated to chief movie critic. He partnered with Chicago Tribune colleague Gene Siskel for their long-running PBS show SNEAK PREVIEWS, and would eventually earn their own eponymous syndicated series. He travels the world over to attend screenings and festivals, and has won the Pulitzer Prize. He basically lives and breathes movies for a living. Inspired by a successful C-U screening of 2001: A SPACE ODYSSEY in 1997, he subsequently lent his name to an event intended to showcase movies that he feels deserve a second chance with an appreciative audience. Sometimes, his definition applies to contemporary films that experienced limited release. It also refers to international cinema that hasn’t yet made it to American shores, or it can mean abandoned formats such as the silent film, 70mm, and Todd-AO. 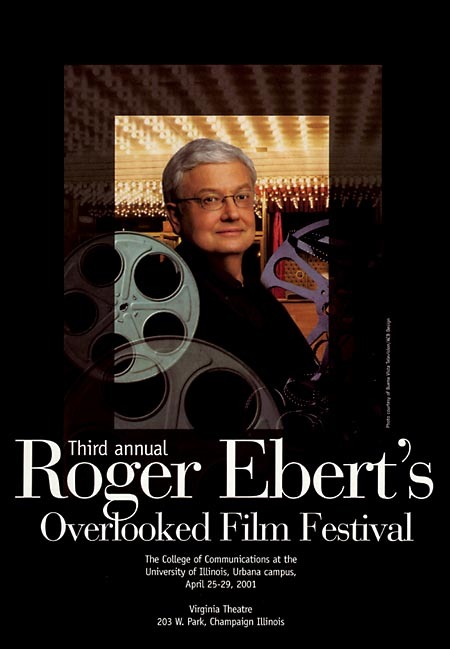 Therefore, we have Roger Ebert’s Overlooked Film Festival, a presentation of the UIUC College of Communications that is hosted at the 1,500-seat Virginia Theater in downtown Champaign each April. Those lazy with their linguistics have dubbed the event “Ebertfest,” for the critic hand picks each entry. As Ebert readily admits, no one is guaranteed to like all the movies, but it’s the exposure and viewing experience that count. While thousands flock to these screenings, another local bastion of film activity lies not five blocks away from the Virginia. Shrouded in the privacy and obscurity of my living quarters is the studio for MICRO-FILM, my high-gloss ‘zine devoted to a league of filmmaking that does not necessarily share common ground with Ebertfest offerings. Yet, both MICRO-FILM and the Overlooked Film Festival do profess a love for the eye-opening movie experience, and the following is my informal tale to tell in regards to the 2001 occurrence of the Overlooked. There he goes, on the side of that bus! There he stands, looming large on that billboard! There he is, looking at us through those familiar glasses in that newspaper ad! The signals had been apparent for weeks that Ebertfest was upon us once again. Things had been a bit rough at MICRO-FILM HQ during the spring; not only had mismanaged time inevitably pushed back the release date of the spring issue to the summer, but talks of bankruptcy and sale had dogged the alternative weekly newspaper where I worked at the time. The Overlooked Film Festival would get me into the world of movies where I belonged, at the very least. I had previously been posted in the ground floor lobby of the Virginia, but because of last minute reorganization I was asked to set up on the second floor walkway behind the balcony. Not only would that potentially cut out most of the traffic that would otherwise pass by me, but I discovered mere hours before the first show that I had to dig up my own table! Aagh! I eventually erected the Temple of MICRO-FILM across from the secondary concession stand, directly in front of a false fireplace. On either side of me stood ferns in heavy concrete pedestals. I felt like I was in a CASABLANCA-style marketplace with only one lonely merchant, and Sydney Greenstreet I was not. If I had remembered to bring along some exotic birds, a camel, and a fedora, the façade might’ve been complete. 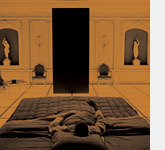 The choice to kick off Ebertfest with 2001 didn’t readily hinge on the novelty that, both in Sir Arthur C. Clarke’s novel and the Stanley Kubrick film, it was written that the HAL 9000 computer became operational in Urbana, as UIUC has been a computer technology pioneer for decades. Or the fact that, gee, it was the year 2001. In reality, Ebert loves big, visionary science fiction movies, as witnessed by his previous “overlooked” picks, Alex Proyas’ DARK CITY (1998) and Steven Lisberger’s TRON (1982). So, why not immerse hundreds of neophytes into 2001’s brave new world on the big screen where the movie belonged? I quickly realized that they had built a break into 2001, not for its length, but because they had to loop the film on two separate platters to accommodate that evening’s 70mm print, freshly struck by the studio. Given the second chance, I ditched my table and sat in for the remainder of the film. It picked up where astronaut David Bowman (Keir Dullea) enters a battle of wits with HAL (voice of Douglas Rain) as the supercomputer doesn’t allow Bowman to dock his pod in the good starship Discovery. Maybe this moment, even more than Douglas Trumbull’s celebrated “trip” sequence, demonstrated the virtues of the extra detail allowed by 70mm as Bowman’s hard, intense eyes and chiseled visage hovered over the audience as each repeated request – “Please open the pod bay door, HAL.” – veered from determination to desperation. Everything afterwards from the solarized landscapes to Bowman’s final, pristine resting-place registered wonderfully on the Virginia’s screen. After 2001 concluded, Dullea and Kubrick brother-in-law Jan Harlan joined Ebert on stage to exchange pleasantries and anecdotes, as well as engaging in conversation with Clarke from Sri Lanka via telephone. And yes, when HAL mentioned that it was made operational in Urbana as Bowman shuts it down, the audience erupted in applause. We were all certified dorks for the moment and damn proud of it. Article © 2001 Jason Pankoke. Used with permission. 2001 graphic: © 1968 Warner Bros. Entertainment Inc. This entry was posted on Friday, April 29th, 2011 at 4:30 pm	and is filed under Alums Done Good, Area Festivals, Article du C-U, MICRO-FILM du C-U, Public Events, Roger Ebert. You can follow any responses to this entry through the RSS 2.0 feed. Both comments and pings are currently closed.